Want to know what goes into making a good cover? Then check out the final cover for my new kids’ book: Just for Kicks! : 600 Knock-Out Jokes, Puns & Riddles About Sports because I think the marketing and artistic teams at Sterling Children’s Books nailed it. The cover says funny and lighthearted. It’s bright orange, the title pops with quirky, off-kilter lettering, and there’s that jester with a big-smile on his face. Everything about it says comedy and kids. It’s not all wacky. After all, sports kids are often cool kids, and that referee is cool, right down to his muscular arm, determined expression, and sunglasses that miraculously stay on his face without anything holding them over his ears. And in case you’re thinking, “Well, I don’t have a giant publisher and its creative team behind me to create a great, eye-catching cover,” this was all done with an altered Shutterstock image. I don’t know the final cost, but it couldn’t have been astronomical. What I do know is that, whatever the cost, it was worth it. I love the cover they put together, and I hope you do, too. 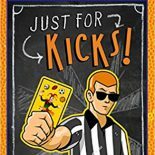 Just for Kicks is set for a September release, but you can pre-order a copy or two today for any young laughers in your life. I hope you do! This entry was posted on June 24, 2018 by johnbriggsbooks in book covers, Book Release, Children's Books, joke books, Just for Kicks and tagged cover reveal, humor.